EHA 415D has the unmistakable outline of a Midland Red D9. She has the operator’s own H72RD body, built in collaboration with Willowbrook. Does this mean one designed it and the other built it, or one built the frames and the other added the panels? We see it, newly withdrawn from service and still in full NBC livery (sorry! ), in the Southsea rally on 8 June 1980. I wasn’t aware that Willowbrook had any involvement in the bodywork of the D9, but I am open to correction if evidence is offered. 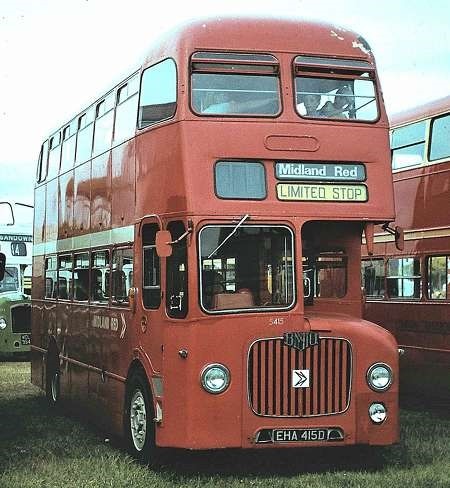 My understanding is that the bodies were built in the Midland Red Carlyle Works on MetSec frames, and incorporated aluminium alloy and glass fibre panelling, as employed previously in the single deck S14 design. It’s come back! Its no good- I have lived in the Midlands in my youth, but I still cannot get fond of Midland Red. I don’t know what it is- that all over red (It was, want it? ), or I can still see those single skin fibreglass domes (is that right- how much more was single skin?) 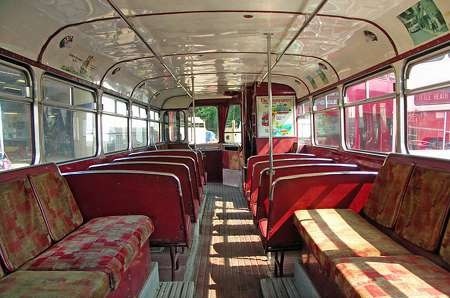 or what seemed rather drab uniform interiors… or I could never get used to that sort of "Billy’s bus" front end: but steady, I’m sure they had many virtues: perhaps they were an engineer’s bus…? Roger, The PSVC lists might be wrong: they say that the D9 has a BMMO/Willowbrook body, with H40/32RD seating, but both Jenkinson and the old "Ian Allan" BBF listings do not mention Willowbrook. BLOTW, however, mentions only Willowbrook as building the bodies. Ah, well . . .
And the ‘captcha’ code for this comment ends in D9 !!! According to ‘Midland Red’ A history of 1940 – 1970 it states "5401-45 bodies completed by Willowbrook"
I confess to being previously unaware of it, though a closer look at my copy of ‘Midland Red Buses’ by M.W. Greenwood confirms that the 45 "tail end charlies" were finished off by Willowbrook, possibly in part because by this time, even before the BET sell out to NBC, BMMO in house production was winding down. Certainly, the D9 design itself owed nothing to the Willowbrook company. I have looked at Steve Richards’ book on the D9/D10 classes, titled "More Room on Top". He states that all the D9s were built at Central Works, except some of the final batch. However by the mid-sixties there was a severe skilled labour shortage at Central Works. The emphasis there was on single-deckers construction, and the final 45 D9s had only reached the part-panelled stage. It was this group which were completed by Willowbrook. They were virtually indistinguishable from the fully Carlyle-built D9s. Steve Richards records that the side lamps were positioned slightly lower, and the small "Midland" display above the destination screens was slightly different. The first four [5401-5404] were delivered in December 1965, the rest followed in 1966, finally being completed in November that year. I would say from this account that these particular ones should be described as "BMMO/Willowbrook" rather than being attributed wholly to the Loughborough company. Here is a picture of an earlier D9 No.5002 (3002 HA) taken in Birmingham in the late 1960s, when the bus still wore the BET style livery and fleetname. Like its single deck counterpart, the S14, the suspension of the D9 was by Metalastik rubber units, though independent at the front. One curious feature of the D9 was the full hydraulic braking system in which the pump was driven from the output side of the gearbox, giving rather peculiar braking responses at low road speeds. 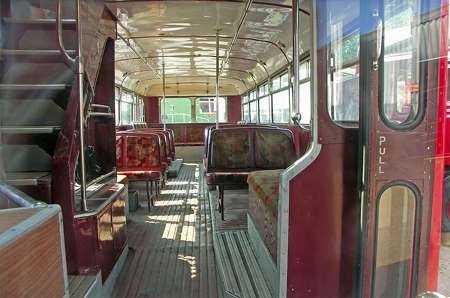 In the Routemaster, the pump was driven at engine speeds. The prototype D9 originally had disc brakes at front and rear, but the first production batch had discs on the front only, with drum brakes on the rear wheels. Even these discs proved troublesome, and all the later D9s were equipped with drum brakes all round, the first batch being retro fitted accordingly. I note Joe’s impassioned plea concerning this operator, so I hope soon to submit a gallery of Midland Red buses to the OBP site for his enjoyment. Apparently this vehicle sometime in the seventies carried an all over advertisement for a ‘Do It Yourself Warehouse’ which could have been called ‘Super D’. I think it was in an all over white livery. Also just above the top front windows a strengthening bar can be seen which was added due to front dome fatigue. This has been an interesting exchange of views! Thanks for your comments. Attached for comparison a side image of 5395 taken in Shrewsbury bus station in 1970. I enjoyed riding on the D9s particularly on the rural services. An unusual feature was the inward facing front nearside seats downstairs. The book ‘ More room on top ‘ is recommended although I am biased as a friend contributed a number of excellent colour photos. I’ve seen the obvious now- that the D9 had a considerable front overhang which gives it its funny look- but as Tony says it’s an Engineer/Driver’s bus… and anything comparable with a Skyliner must be OK. We’ve been here before but compare this overhang & everything else with its contemporary the Wulfrunian and you can see how folk were thinking then, especially if rear-engine to them meant Renault 10! It was not only D9s that were finished off by Willowbrook. S17s around the same time were and I believe both Willowbrook and Plaxton were used. Serious production difficulties caused by skilled staff shortages. Interestingly outside contractors were not used for the later S21 and S22 types but Plaxton were used for S23 by which time all production was stopping. Although every D9 appears to have been modified and allegedly no two buses were the same, the Willowbrook finished ones are identifiable by the trim above the front wheel arch. MidlandRed.net is a good source of information. I have only just seen the comments re Willowbrook completing D9s. I can remember seeing them in skeletal form travelling along the then A50 towards Coalville. Their destination was confirmed by my father who was based in the divisional traffic office in the 1960s. The drivers would have had to take the scenic route round Ashby in order to avoid two low bridges, hence their appearance in Coalville. I am unable to say which route they used onwards to Loughborough, but the M1 would have been available from November 1965! I must comment on the subject of the BMMO D9 (and BMMO’s in general) as a former Midland Red engineering supervisor of 25 years service.The bodywork of the Willowbrook examples might have been finished by them but the chassis was certainly built at Carlyle works-the works itself did not close.The D9 was of monocoque construction and would have had the outer panel skin added by the coachbuilders.A few more facts:D9’s were NOT disc braked,except the prototype 4773,the rest were all round hydraulic drum braked,unlike the single deckers.4773 by the way still survives,being currently restored from derelict condition.D9’s may or may not have been single skinned but they were sturdy and stable enough,as anyone who compared a ride upstairs on one with a Fleetline (DD11) on the 658 Leicester-Coventry service-the Fleetline swayed about like hell (a well known trait of Fleetlines in crosswinds.) In general BMMO’s WERE an engineer’s bus,easy to work on and reliable,but also a driver’s bus,with excellent roadholding and braking.The 10.5 litre engine (same as CM6) was probably the finest the UK bus industry has produced. What other PSV diesel engine (in a single decker) could get away with no cooling fan at all? These were a suberb bus. the slight setting back of the front axle reduced the wheelbase slightly and I assume this was to make the bus slightly more maneuverable or perhaps the suspension design necessitated it? I think this particular feature did incur some pitching on certain types of road surface but that aside they were excellent and likes by the drivers, which speaks volumes. I have had the privilege of driving one occasionally and the front suspension certainly irons out road imperfections.It was only the final batches that were finished by Willowbrok just as Plaxton finished some of the saloons from the same period. There are constant references to these buses loosing the power steering if the brakes were applied, the two systems were separate and I can’t see how that could happen. This was one of the second batch of S15s. Broadly similar to the S14 bus, these were designed as dual-purpose vehicles and featured bucket-seats and double rear wheels as well as, on this second batch, some chrome trim. 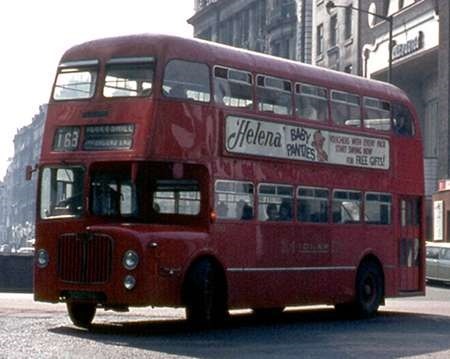 Circa 1969 the batch was relegated to bus work after being repainted into the standard bus livery. While dual-purpose they had black roofs. In this shot 5056 is seen at the Black Country Living Museum in September 2014. I recall 5048 HA (allocated, I think, to Coalville depot) as a regular performer on the Birmingham – Nottingham route X99 in the 1960s. Those bucket seats were pretty comfortable. There’s something in the ‘copy’ which intrigues me, Les, and thanks for posting. There is mention of double rear wheels as if this is something of an innovation. 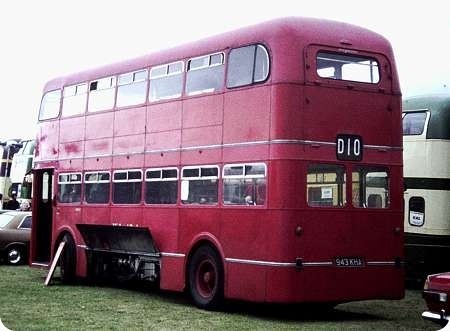 Given the company’s leadership in so many aspects of bus design and operation, were these really the first Midland Reds to have twin wheels at the rear? Peter, As I understand it, most of the S14 class were fitted with single rear wheels as part of a desire to produce a light-weight vehicle. Unladen weight was not much over five tons according to M.W. Greenwood’s excellent book – ‘Midland Red Buses’. The S15 was a further development of the class but with modifications, including twin rears, to produce a dual-purpose vehicle. I am no expert on Midland Red, but I suspect that the S14 had single rear wheels as an experiment. Both AEC and Leyland tried this with their underfloor-engined buses, but found that road holding suffered. I think what Les meant to convey was the fact that the previous S14, built to a lightweight design, had single rear wheels. Nigel is quite correct regarding single rear wheels on the S14. Although I drove S15s in service (5050, 5055 and 5073 (now preserved)), I never had chance to drive an S14 so I can’t comment on their road holding. Thank you for filling this gap in my knowledge of Midland Red. There are 2 S15 in preservation but this one is the only one with original DP seats. It has also been retro-fitted with the 10.5 litre engine. The driving position is not comfortable and requires some getting used to given a tight cab and upright pedals. I sold it after getting a left knee problem and so did the previous owner for the same reason. It is really fast on the road and my claim to fame is 2hrs 40mins from Gateshead to Digbeth some 4 years ago after a Bus Rally. Roger B- I’ve just seen reference to your record breaking run from Gateshead to Digbeth. Were you trying to recreate the glorious days of the Midland Red Motorway Expresses? Don’t let the rozzers read this, but it would mean an average speed of at least 75 mph start to finish! In hindsight I probably meant 3hrs 40mins. It certainly was a fast trip but we would not have gone over 70. The vehicle is geared for 75 with the gearbox/engine combination. I was ‘taken for a ride’ on the top deck of Roger’s beautiful D9 (5424) around Bewdley at a Meet. I can vouch for his spirited handling and was treated to his own version of the "tilt test"!, afterwards speaking to him he did say "I drive like a bus driver", long may he do so. I travelled from home from school at Godalming to Guildford back in the ’50s and remember a couple of occasions when a bunch of us managed to get down the hill in time for an earlier bus than the usual one, we all piled up stairs but by the time we were leaving Farncombe the conductor had to come up and tell us to get down stairs because there was an insufficient number of passengers downstairs so the weight in the bus was to high for stability. He probably didn’t use those exact words but the meaning was clear. The conclusion submitted by Larry B (above 27/06/15) is quite correct as my memory of working at Redditch Garage in 1968 includes one morning with an S14, in the snow on the hilly terrain the only way to make progress was to place the rear wheels in the gutter and "sidewall" the bus along. The S14 was notorious for poor rear holding even in wet weather. 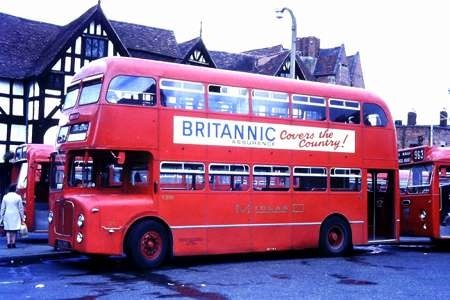 This fascinating vehicle was the first of two prototype underfloor-engined double deckers built by Midland Red in 1960/61. AEC had shown such a layout was possible, with its Crossley-bodied Regent IV underfloor-engined decker prototype of 1950, which conformed to minimum gangway headroom requirements, while remaining within vehicle maximum height limits. The AEC had a rear platform however, whereas the Midland Red D10 design took this one step further in having the entrance alongside the driver. As was expected of Midland Red, advanced features were to the fore and the D10 sported chassisless construction, power steering, semi-automatic transmission, disc brakes and ‘Metalastik’ rubber suspension. However, the most interesting feature was the offsetting of the midships-mounted BMMO 10.5 litre horizontal Diesel engine to the nearside of the vehicle. In order to avoid raising the lower deck floor level more than necessary, the highest parts of the engine, the flywheel and housing, were thus positioned to the side of the gangway (under nearside seats) rather than being directly below it. 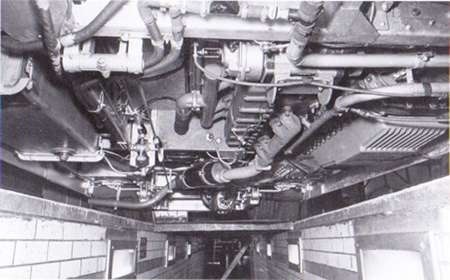 Consequently the slimmer parts of the engine, the cylinder heads, were beneath the gangway, allowing it to be lower. A second prototype was built in 1961 (4944: 1944 HA), and was originally to a two door / two staircase layout. The front entrance was of normal width but the rear exit was of a narrow design, and 4944 was converted to conventional single door/single staircase layout in 1962. (Intriguing how the HA registration followed the KHA mark, rather than the other way around). 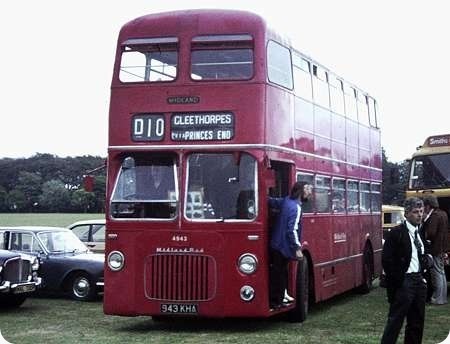 No more D10’s were built, but fortunately 4943 has been preserved, and is seen here in Harrogate at a Trans-Pennine Rally in, I think, the mid-70’s. The D10s always appear to me to look quite tall . . . what was the overall height? and how does that compare with a Volvo Citybus or Leyland Lion DD?? Presumably, if BMMO had put the D10 into production "new bus grant" would have subsequently killed-off the under-floor design anyway (even if BMMO hadn’t been forced to cease vehicle production in 1971[?]). But here’s a thought: couldn’t the off-set engine layout have formed the basis for a lower-floor under-floor-engined single-decker – more suited to urban use then contemporary designs, and perhaps an alternative to rear-engined chassis? The D9 was sometimes called the Birmingham Routemaster, so this could be the Birmingham FRM. No one really mentions that the Q was a design not unlike this – but way before its time. Of course the Volvo D10M or B10DM (depending on age and in which factory it was built) was perhaps the most successful bus of this concept – but don’t forget the Leyland Lion either. Good that 943 is still with us, though. And, about 25 – 30 years later, came the Volvo D10M, as used by Southdown. Once again, Midland Red leads the field! Nice views, Brendan. Thanks for posting! Do I spy a Wulfrunian lurking in the background of the second shot. I think you did, David. Allowing for perspective look at the heights? Have you noticed that every window bay in the lower deck and every bay except the front in the upper deck has a sliding window included (ok hinged vent in rear upper deck bay). That’s quite unusual. I worked in Stoke when the two D10s were at nearby Stafford yet I never went to look for or travel on them. Can’t believe it! Sometimes we could kick ourselves for missed opportunities, Ian. 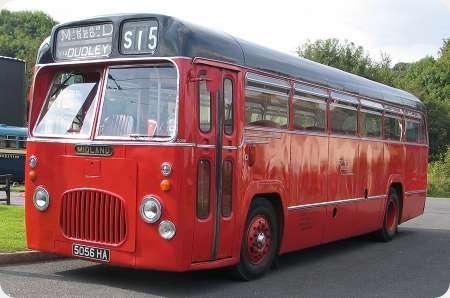 As far as I know all BMMO double deckers built from 1950 onwards, D5s through to D10s, had a full set of sliding vents both sides, with the exception of the all Leyland LD8s. Both of the D10’s ended their days operating from Stafford depot. One day my friend and I caught the train from Manchester to Stafford to spend the day riding on Midland Red buses; we visited Walsall and Wolverhampton. On returning to Stafford we had half an hour to wait for the train, and one of the D10’s was in service. We boarded it and travelled to the first stop, just to say we had ridden on a D10! If the D10 had entered production, would it have been copied by other bus builders? It might have resulted in a shorter production life for the Atlantean and Fleetline. Not sure if I have put this in the correct posting. May I add some comments on the BMMO underfloor engine? As a Midland Red engineering supervisor at a certain garage operating CM6’s and numerous other types, for many years, there are one or two points that should be mentioned. One is that having worked on these and Leyland Leopards side by side, the huge difference in engine accessibility cannot be ignored. The BMMO engine was surrounded by acres of empty space, every necessary component was easily accessed, often from under the side without need for a pit. The starter motor for example, could be changed in five minutes flat. I know, I did it many times. Alternator, water pump, fuel system etc, ditto. Jobs that would take at least twice as long on a Leopard. And this brings me to point number two: the cooling system. The BMMO system was non-pressurised, it ran cool most of the time, largely due to the large water capacity – I think 17 gal. on S17/CM6 onwards-no cooling fan, and those masses of empty space to allow air in! And a cylinder head design which would tolerate a leaky gasket for days if kept topped up, despite a radiator of oily water.., at least, in local use. A blown head gasket on a Leopard spelled trouble! Usually a cracked cylinder liner unless you were lucky. It was a great shame that the magnificent BMMO 10.44 litre engine wasn’t adopted for a new standard NBC design: I believe a top secret rear engined prototype was built and tested at the beginning of the 1970s, but the Leyland lobby won the day, and we got the dreaded National… thanks for the chance to talk of old times…great times. Another sad indictment of NBC and BLMC Michael. "Intriguing how the HA registration followed the KHA mark, rather than the other way around." Smethwick started reversed registrations in September 1955 with 1 AHA. Upon reaching 999 MHA in April 1960, they decided to start issuing 501 HA etc on cars, buses and trucks – the three-letter series continuing only on motorcycles. They reached 9719 HA before adopting the year suffix system in August 1964. Fascinating to read Michael F’s account of the D10’s qualities and of its unfulfilled potential, and until reading Brendan’s piece I hadn’t appreciated how ingeniously the designers had positioned the engine to minimise intrusion. One question: surely such a concentration of weight on the nearside—not only the engine but the gearbox as well—must have caused problems? At least the AEC Q had an offside engine, tending to counteract the road-camber effect. I assume that Cleethorpes did not normally figure on Midland Red destination blinds – not double deckers at any rate?! Ian, the location of the fuel tank on the offside would have surely contributed some weight balance to a degree. Thinking of unbalanced chassis, I wonder if the Bristol VRL might have suffered from handling problems with the concentration of so much weight in the overhung offside rear corner. Ian, Peter Nash’s fascinating book ‘Push Once – life in the bus industry’ mentions problems related to the D10’s engine being mounted off centre. Apparently this did cause brake linings and parts of the suspension system to wear unevenly, but the most serious problem appears to have been that "the engine location compromised the integrity of the frame leading to cracks in stress panels in later life". As the vehicles were in effect prototypes, surely this problem could have been overcome with further development? That said, Bristol-ECW encountered a few structural problems over the years with the LS semi-integral design, and eventually the model was replaced by the MW, which reverted to a traditional chassis frame. There must have been some issues with cooling as at some point 4943 had been fitted with an electric fan, presumably thermostatically controlled. I dare say for the majority of time it was not needed, but I expect sitting in traffic queues may have made a difference, not that there were many of those in Stafford. I took these pictures of D10 4943 in 2008. It can be seen the nearside seating was on a shallow platform, with the only real intrusion into the saloon of the mechanicals, in the form of a small ‘hump’ midway down. Otherwise the floor area was remarkably clutter free. Thx, Mark, for the photos. The floor is commendably level and clutter-free, with a complete lack of a dwarf-only area at rear of so many current buses! Mention of Stafford brings back memories of English Electric and 16MU RAF Stafford, where I was based until 1959, thus missing seeing this vehicle! I doo recall the sole, grossly-overloaded bus which ran all night on Sunday nights, ferrying returning airmen to camp. Like the King Alfred Regent V healing over, displayed recently, we often wondered if our bus was going to recover from its alarming angle! Standing passengers upstairs does NOT aid stability! Regarding Cleethorpes on the blind, many Midland Red garages ran summer dated Holiday services to resorts, for example the Eastern/Leicester area garages ran to such places as Skegness, Mablethorpe, etc; these services more often than not were run by Dual Purpose vehicles : the point being the destination blind would be the same one fitted to every type of vehicle (except full coaches which rarely ran on any type of stage carriage). There were also other far flung places on some garages blinds, as again the stock with comfier seating would quite often be used on Associated Motorways work where BMMO would be joint operator of a route, and such places as Bristol, Cheltenham, Glasgow, Manchester etc. would feature. An interesting view of the underside of 4943, showing the deft positioning of the mechanical’s. The engine was placed the opposite way round to the single-deckers ie; cylinder heads towards the centre/crankcase to nearside, thus avoiding raising the floor level. Taken when new in Carlyle works – so ahead of it’s time. I remember seeing 16MU on the destination blinds of Stafford buses in the 80’s and wondering what it was, now I know! The bearded gentleman leaning out of the bus is Keith Bodley, and I was probably not far away when this picture was taken. Having driven both D10s at Stafford "1965" I never found any handling problems, however one problem that did occur was with brake failure 4943 this was corrected though very quickly. One interesting point was D7 4162 was fitted with a turbo charger one could always tell the difference as with the engine under power it would have a whistling from the exhaust. Leyland Fleetline deckers were very unstable in windy conditions you were always correcting the direction of travel, also the single decker "Leyland National" would often not go over the slightly raised surface of bus stop laybys when it was raining no problem with any BMMOs though.Having travelled on many service buses throughout the last sixty years I have never found any modern PCV,s that matched the comfort quietness and lack of rattles of BMMOs.